The Honourable Prime Minister of Tonga Samiuela ‘Akilisi Pōhiva officially launched the Pacific Geospatial and Surveying Council Strategy 2017-2027 today in the presence of surveying and geospatial specialists from around the region and the globe. 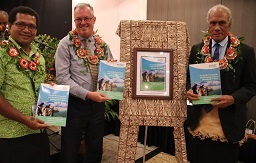 The 10-year strategy represents a global first, as it is the first geospatial and surveying strategy to be collectively produced and endorsed by a regional advisory body- the Pacific Geospatial and Surveying Council (PGSC). “I am very pleased to be hosting this event here in Tonga. The Ministry of Lands and Natural Resources has been extremely busy with recovery work for the past two months, but I commend them also in their dedication to the long-term regional vision of the PGSC,” the Hon Samiuela ‘Akilisi Pōhiva said during the launch.The Prime Minister recognised the launch as timely given the aftermath of Cyclone Gita and the importance of geospatial information and surveying in the immediate damage assessment stages and also in the mid-to-long term rebuilding plans. “There will always be natural disasters and hazards in our region and that we must continue to build our national and regional capacities to anticipate and respond to these,” he added. The Pacific Geospatial and Surveying Council Strategy highlights the development priorities of Pacific Lands and Survey, Geospatial Information Management, and Hydrographic Departments and provides the strategic direction for strengthening the capacities of these agencies. The PGSC meeting will conclude at the end of the week, and is held in conjunction with United Nations Initiative on Global Geospatial Information Management (UN-GGIM) International Workshop on Legal & Policy Framework for Geospatial Information.